A dental crown is one of the most common dental procedures, but the term still inspires fear in many people. In reality, it shouldn’t. A tooth crown is less invasive than it sounds and isn’t very painful. Understanding what it is and when you need it can make you feel more comfortable about getting a dental crown. A dental crown is a procedure that is both cosmetic and structural. During the procedure, your dentist places a cover on a damaged tooth. That helps restore it back to its original shape and makes the tooth stronger. Tooth crowns have made it possible to repair damage teeth and to keep your teeth looking great. Tooth decay happens when the plaque in your mouth produces a bacteria that eats away at your tooth’s enamel. Although enamel can usually repair itself, it can only do so much. When there are too much bacteria in your mouth, the enamel can’t repair the tooth quickly enough, and the decay takes over. The decay weakens your tooth and compromises its structure. And there’s no known method to grow back a large portion of a tooth. When tooth decay gets bad, one of the only ways to fix it is with a dental crown. It can save your tooth from removal. One of the most common dental injuries is a chipped tooth. Both painful and cosmetically unappealing, a chipped tooth is not something to be ignored. A dental crown can be used to cover the crack, which will keep it from getting worse. Even better, it can hide the chip in your tooth to restore your smile. Broken teeth include teeth that are cracked, missing fillings, and broken off at the gum line. Because broken teeth can’t repair themselves, the only option is dental work. In some cases, no repair is possible, and the only option is removal. However, in many cases, a filling can get the job done. A dentist often uses a tooth crown to keep that filing in place in order to prevent further damage to the tooth. Fillings are great, but they don’t offer the same type of protection that a dental crown offers. If you had a large filling, you might need to get a crown to prevent any further damage. An older, large filling could end up cracked and damaged without a dental crown. A dental bridge covers the gap between missing teeth. In the procedure, a dentist takes two or more existing, healthy teeth and places a false tooth in between. Traditional bridges use a dental crown to anchor the teeth together. When there is an injury or large cavity in a tooth’s root, a root canal is necessary. A dentist removes the damaged area of the tooth and replaces it. But the tooth needs to be fit for chewing, especially if it’s a molar. That’s when a tooth crown comes in handy. By covering the root canal, a crown covers the area and makes it safe to chew. A dental implant is yet another dental procedure that involves a crown. An implant is a tooth-root replacement that replaces a missing tooth. After a dental implant is placed in your jaw, a dentist fits a dental crown to the implant. The crown looks like all of your other teeth. A smile is something that you want to be proud of. But when one or more of your teeth is extremely discolored, it’s hard to love your smile. 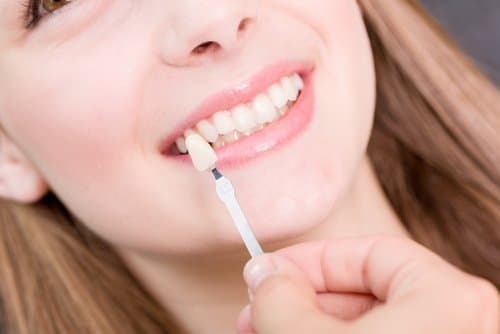 In most cases, discolored teeth can be fixed by a regular dental cleaning, whitening toothpaste, or a bleaching treatment. However, after a root canal, bleaching or whitening won’t help. A dentist can place a bleaching material to the interior of the tooth, or a dental crown can cover the tooth. Having a crown can give you back your smile. What should you do when you think you need a crown? If you think you need a dental crown, you probably have a lot of questions. How much does a dental crown cost? Is it a painful process? How long is the procedure? Don’t let the questions stop you from seeing your dentist. A tooth crown may be the answer to your problems.